I’ve had a few issues upgrading WordPress recently. I thought I was going mad, but it turned out to be a really annoying bug. Recently, I upgraded my virtual private server (VPS) to the latest Ubuntu release (Ubuntu 16.04). I did this for two reasons. First, it’s good to be on a recent release, and Ubuntu 16.04 is a long term support (LTS) release, meaning it’s supported for longer than other Ubuntu releases, and aimed more at stability for things like servers, rather than all-new features which might be a bit sharp around the edges. Second, Ubuntu 16.04 came with PHP7 out of the box, which provides drastic performance improvements which, on a VPS, is very useful as CPU resources can be a little constrained. It also gave me a chance to burn the old install to the ground as over the past three years or so, I’d tested a lot of things out on it and I wanted everything to be nice and uniform, putting into practice some of the things I’d come up with along the way, like my automated website creation script. 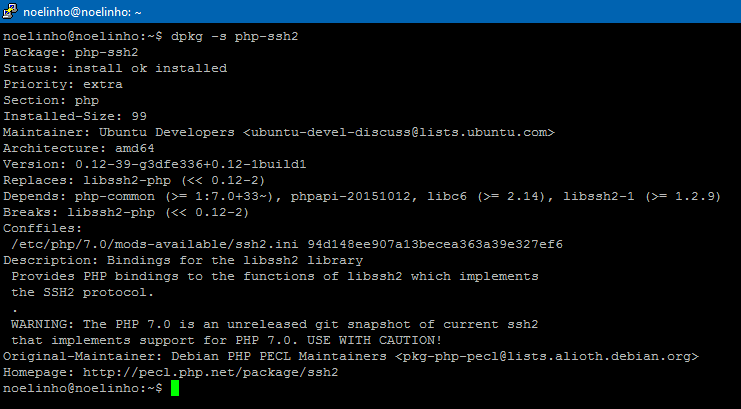 Anyway, on my Ubuntu 14.04 install, which used PHP 5.6, I had automatic updates set up on my WordPress installs. They worked nicely and provided good security, as I used SSH2 for the updates, meaning the files and folders the WordPress install lived in were not modifiable by the web server itself. I host multiple websites on my server, and to enhance security, each site is owned by a different local user, and each database has its own user, so if one site is compromised, it’s harder to compromise the rest. The web server shouldn’t really have write access to local files, but it needs write access to update WordPress automatically. By using SSH2 for WordPress updates, the web server can get the access it requires without having direct rights. It works well. The problem is, it’s broken in PHP7. No matter what I did, I could not get updates to work. I came across various error messages, and after a lot of hunting around and double-checking, I was sure it wasn’t because I was doing anything wrong. And it turns out I was right to be sure. A problem with the php-ssh2 breaks updates for WordPress. If you have this problem, you’re probably not going mad. Fortunately, I can offer a solution: SSH SFTP Updater Support. There’s something I get excited about every year that everyone pretends not to care about. Secretly they love it. Eurovision is here? Wondering what to expect? Look no further. Two of the Northern European countries are already through to the final: the United Kingdom, as one of the Big Five, and Sweden, last year’s winners and this year’s hosts. Sweden are one of the favourites to win; the UK will be looking for somewhere close to the top ten. I’ve given up guessing how British entries will do at Eurovision, but there’s been less negative press around Britain’s entry this year. Iceland are represented by Greta Salóme, who was at Eurovision in 2012 when Iceland finished twentieth in the final in Baku. I’m not convinced. Norway are represented by Agnete Johnsen, five years after she finished second in Norway’s qualifying competition Melodi Grand Prix as part of the BlackSheeps. I love it, but it has an unusual transition from verse to chorus that might be too much for people to really love from on listen. Nicky Byrne represents Ireland, but that’s as good as it gets for them. No one in Europe will care for his past credentials, and the song is weak. I don’t see it making the final, so if you want to catch it, make sure you see the second semi-final. Of the Baltic States, Latvia are the strongest. They open the second semi-final. The song is probably too much a grower to win, but may do very well. It’s written by Aminata, who finished sixth for Latvia last year – their best finish since 2005. Two Western European countries are already in the final by virtue of being in the Big Five – France and Germany. Germany has a chequered history in Eurovision, and France’s history is more on the side of glorious failure – sometimes justified, and sometimes simply unappreciated by the rest of Europe. Germany didn’t score any points in last year’s final. Their entry this year is from the winner of their version of The Voice. I quite like it, but it’s not going down well at all with others, so it’s likely going to finish bottom of the Top Five this year. France, by contrast, have brought an entry that’s garnered a lot of attention. It opens in French, but the chorus is in French. It’s an upbeat song, and will do much better than some of their moodier entries from recent years, or the car crash of Twin Twin in 2014 (which had a great studio track, but was disastrous on stage, turning into the worst din I have had the misfortune to hear). Some think it will win. I think there’s better, but the outer reaches of the top five might not be too far away. Austria also failed to score last year – unfortunate given they hosted the event. I really like their entry this year, probably because it’s a half-decent, upbeat pop song, in French, with a violin in the background. It ticks a lot of pleasant boxes. Unfortunately, past experience tells me Europe will be unimpressed and Zoë won’t be asked to turn up to the final on Saturday. This is a large section. Two more countries go direct to the final as members of the Big Five: Italy and Spain. Both are tipped to do well this year. Personally, I think Spain will ultimately struggle with a song that whilst pleasant, isn’t particularly memorable, whereas Italy should be comfortably around the top ten with a contemporary number that mixes Italian (which is always worth more points, as opposed to French which I always think is a penalty) with English. Since Italy returned to Eurovision in 2011 their record has been very good, and they should be confident of beating most of the Big Five on Saturday. Greece have always qualified for the final since the semi-finals were introduced, despite a few questionable acts. Aphrodisiac (2012) was cute, but hardly tuneful, yet finished fourth in its semi-final. Freaky Fortune and RiskyKidd (2014) finished seventh in their semi-final with a terrible song only made slightly better by a trampoline the act bounced on during the song, giving you some vain hope they might fall off, break their neck and save you from the rest of the song. If there is any justice, this year will finally be the year they fail to qualify. Perhaps reflecting the vast expanse of land and culture between these fair isles and the far reaches of Southern Europe, there’s a lot of entries here I wouldn’t give much light of day. Montenegro are usually the best example of this, and this year is no different. There’s also Albania, F.Y.R. Macedonia and others who you’ll not worry if you hear them only once. The standout entry from this section, however, is Malta, which closes the first semi-final and is a sure-fire qualifier for Saturday. With Molly Pettersson-Hammer on backing vocals, it’ll be interesting to see how high this song can go in the final. Eastern Europe is a fairly small bunch of countries and a bit of an eclectic mix. Ukraine return to Eurovision this year having pulled out in 2015 owing to the unrest in the east of the country which Vladimir Putin most definitely has nothing to do with. The song is called “1944” and is about Stalin’s treatments of Crimean Tatars. How it passes Eurovision’s political test, I’m not sure, but it’s a good song with a message that if understood, will certainly resonate with many. Bulgaria were well-fancied in the run-up to Eurovision this year, but seem to have dramatically underwhelmed in rehearsals. That’s a shame because on track recording only, it’s one of the best songs of the year. It’s reminds me a little of Hungary’s Kati Wolf in 2011. A shame. And so we come to the final Eurovision group: the countries which aren’t really in Europe! This includes Cyprus, which whilst in the EU and using the Euro, is officially (according the United Nations) in Western Asia. Which, conveniently for me, helps reduce the size of Southern Europe. Russia appears in this group, and they are currently the favourites to win. Australia are fourth favourites, despite Graham Norton’s disapproval. Armenia has also had a lot of hype, including a little coverage from some leaked footage of the jury semi final. But, to be honest, none of this group really light my fire*. *Congratulations if you understood that reference. Yes, it’s been a bit quiet for the last few weeks. There’s a good reason for it, honest. You may have noticed I’ve been very quiet recently. Well, there’s a reason for that. I bought a house (technically half a house, I guess – joint mortgage), and it’s taken up a lot of my time. Between packing, moving, buying furniture, making furniture, unpacking, fixing problems, working and a few other things, I’ve been rather short on time. But it’s been interesting – perhaps more for me writing than you reading, but since you’re here, I’ll share it anyway. The first thing is, everyone else seems to find mortgages a lot more stressful than I do. Perhaps I’ve just spent longer thinking about them than other people. Maybe it’s because I’m borrowing what I can afford to pay back rather than breaking the bank just because the bank would let me. Or maybe it’s because, in the warped world of the UK housing market – yes, even in the cheaper reaches of the country – it’s significantly cheaper to pay off a mortgage than to rent at market rate. If I had to pay rent at market rate, that would stress me out! The second thing: solicitors. It’s amazing what being paid does to them. Before you pay them, they’re helpful. Afterwards, not so much. I’m sure I can hear a cynical voice telling me I should have expected that. The hardest thing was trying to work out what we really needed to get looked at first, and what could wait. I decided making the doors lock was probably the most important thing, but not flooding the house, and making sure it wasn’t about to burn down, were fairly important too. No phone line means no internet, so that couldn’t stay that way for long either. So, the guttering and the TV aerial will have to wait. The good thing is, in amongst all those things that needed looked at, so far none of them have been terribly expensive or difficult to fix. The electrical work took two days and we needed new sockets, but the wiring itself was fine and we got a shiny new fuse box too. The leaks were simple to fix too, and hadn’t (as far as we can see) caused much damage. Of course, once you’ve looked at all that, then there’s all the things you want to do to the property outside what you need to do. The list basically consists of redoing every room in the house and building a whole new garden, but obviously you can’t do all those at once. We decided we should probably redecorate one of our bedrooms – in hindsight it would have been good to think about that before we got halfway through building a bed in there. Also, your Ikea Family Card comes in really useful when someone accidentally screws right through a board they’re not meant to.